Didn't want to hijack habibie's post here for buying the steam link so here's everything so far. Gravelrash included some links for some hacks. You will need to reboot after doing this to take affect. That didn't work for me so I went with it another way, mostly from here. Besides it is straight from the source ;) You need to put a single usb stick in that will be overwritten. "You can factory reset via USB. Create a file named factory_reset.txt (If you're on windows and you have file extensions hidden just name it 'factory_reset' without the .txt). Inside the file put some data, just a '1' will do. Unplug your steam link and plugin the USB drive. Re-plug in the Steam Link and it should start the factory reset." After the update, navigate to the System Settings page to ensure that both the Release and Build version have been updated." Found something you want added post below and I will add to first post. "Blah bla blah blah bla"
I don't have a tv so couldn't test the home media or the setting the default resolution hacks. If you can confirm I will be glad to add. Edited 3 time(s). Last edit at 12/30/2017 03:42PM by feas. Cool! please post dmesg output. Thank you and this is definitely a great start. > Cool! please post dmesg output. Hmmm. Seems I have a lot of bad block errors. Perhaps someone has a cleaner version we can post since mine may cause differences because of. No news on the steam link front? I finally came around to do this, hope this helps. freshly unboxed, nothing else done with the steam link yet beside putting in the wifi password. Tell me if you want me to execute or try anything else. However you have to give me the exact commands as I am not good with linux. I would be very happy if we can have debian directly installed as I have a few of them stored ;). PS. : some lines have characters pushed far to the right, not sure if it is send by the steam link that way or my putty character formating is wrong. But I think the information are all there. [    7.338179] 8897mlan: module license 'Marvell Proprietary' taints kernel. [   10.150808] BT: FW already downloaded! [   21.688483] gpu warning: of_property_read_u32 for 3D core-clock-register fail                                                                                                             ed! [   21.688494] gpu warning: of_property_read_u32 for 3D sys-clock-register faile                                                                                                             d! [   21.688499] gpu warning: of_property_read_u32 for 3D core-clock-bitfield fail                                                                                                             ed! [   21.688504] gpu warning: of_property_read_u32 for 3D sys-clock-bitfield faile                                                                                                             d! Edited 1 time(s). Last edit at 01/30/2018 04:08PM by bodhi. You can always pipe the output from dmesg to a file, i.e. dmesg >& filename or dmesg > filename, and then use scp utility, i.e. scp filename your_Linux_account_name@Your_Linux_computer_IP_Address:~/ (~/ is your home root directory on your Linux computer), to send it to your computer so you can attach the file to your post. For a file like this, I consider it as a temporary file and prefer to transfer it to /tmp directory on my Linux computer. [    7.121784] 8897mlan: module license 'Marvell Proprietary' taints kernel. [    9.982450] BT: FW already downloaded! [   12.214623] gpu warning: of_property_read_u32 for 3D core-clock-register failed! [   12.214635] gpu warning: of_property_read_u32 for 3D sys-clock-register failed! [   12.214640] gpu warning: of_property_read_u32 for 3D core-clock-bitfield failed! [   12.214645] gpu warning: of_property_read_u32 for 3D sys-clock-bitfield failed! I did some digging and found some interesting sources. Too bad the one that started it and seems to be knowing what has to be done isn't intrested in investing more time. no time to look at the outputs yet or was I too stupid to produce anything usable :D? Thanks! you did provide almost as much as I expected. However, dmesg showed a lot of NAND errors and the beginning of the sys log was gone, i.e rolled off (this kernel log buffer must have been set to a quite small size). Also I was looking for some clue about u-boot and and did not get that (stock OS does not have it). The problem is we don't have any way to connect serial console or JTAG (so people tried the kexec or chroot approach). What I am really interested in finding out is if there is serial console pinout, but nobody has determined one way or another yet. > OS does not have it). So, where do we go from here? Should one try to identify the serial pins directly on the processor and try to solder some small wires on? How feasible is the kexec approach, or what disadvantages does it have? Before you can execute the commands, there are a few things you should know. When you load a new kernel by running kexec you are overwriting the existing kernel with the kernel you specify. While this has the effect of rebooting the system quickly, it also skips the process that resets all of your hardware to a "clean" state, which can have some unpredictable consequences depending on the hardware that you use. For example, the video card on my system is an old Nvidia GeForce2 Go, and I had been using the legacy driver from Nvidia for it. After using kexec to reboot, the video never worked correctly. When I switched to the open source driver, the video came up just fine. Outcomes like this may be as varied as the kinds of hardware that exist. You just need to be aware of the possibility of problems in case something happens that you don't expect. Edited 1 time(s). Last edit at 02/14/2018 03:22AM by Gravelrash. So I did not like kexec that much. This box has a secure boot. The way to defeat that and boot a normal kernel is to replace stock u-boot with a new one using serial console. > This box has a secure boot. The way to defeat that and boot a normal kernel is to replace stock u-boot with a new one using serial console. With so many steam links sold for cheap and probably lying around I am surprised that there are only a few people (not referring to this community) online trying to install a mainstream distro on this box. But maybe many people tried and find that the apparently lack of a serial port is too big of an obstacle to invest more time. The "pogoplug-hype" years ago was probably due to the easy to find serial pins. Too bad I can't really contribute much in finding those darn serial console pins. That confuses me too. One would expect at least some activity. I tried asking on stackexchange and was basically told to forget about it. Anyway about those pins. The four fellows just left of the ethernet port, look very suspicious to me. It would make sense for them to be on the edge of the board and they don't align with USB ports on top of the board. Now we should look for the HW Reference Manual for this SoC. Won't work, Internet Archive might help, but I wouldn't bet on it. The product line was sold to Synaptics so we might be lucky there. And we know that it's a standard A9 Cortex chip, so we can use it's documentation instead. It would need to be adjusted for the Steam link, obviously, but I don't have know-how to do it. We run into substantial risk of bricking the Link. BTW: Chromecast uses MV88DE3100, that's completely different, custom processor by Marvell. They only share general architecture and instruction set. > Synaptics so we might be lucky there. > so we can use it's documentation instead. Not really. We need HW manual. The A9 Cortex architecture is common. But when it is used in a specific SoC, it is no longer relevant. 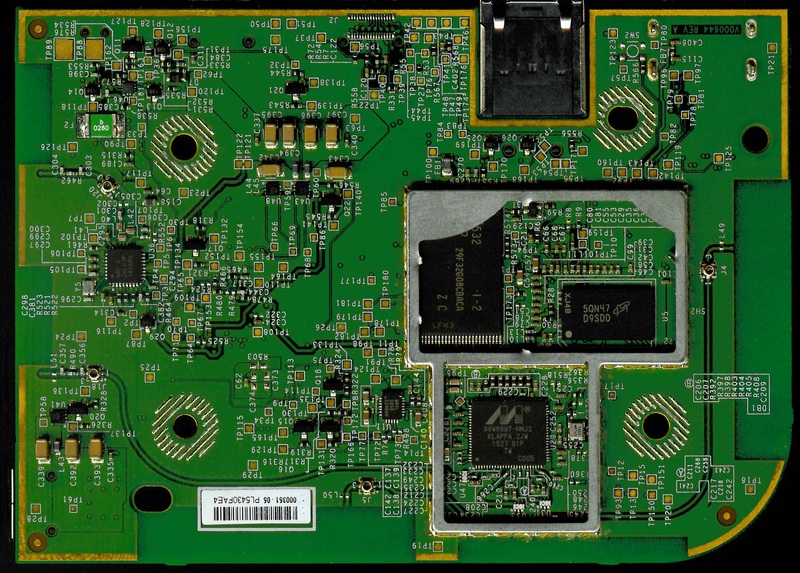 The manufacturer like Marvell has a different way to have their board layout. Such as armada-1500-plus-88de3108. > run into substantial risk of bricking the Link. > So, unless you got spares I would be very careful. True. But it does not do us any good if we can't flash new u-boot in serial console or JTAG. So we need someone who can probe those 4 pins to see if they are indeed serial console pins. If we are lucky and they are, we don't need to look for other documentation, right? I Could crack mine open but I don't have the tools (like logic analyzer) nor the knowledge to test those pins. as far as I understand (which is very vage and even possibly wrong), you could flash stuff, but the bootloader will only boot a kernel that is signed by Valve. To change that behaviour, we need to swap that out-of-the-box bootloader with a customized u-boot which can load any kernel we want. And for that we need the physical serial console pin. That "thing" we ssh into won't do. Basically, we need serial console because without it, we have no way to test new u-boot before flashing. Flashing in Linux is a normal method to replace u-boot, but only after we know the new u-boot build works, and also have access to the mtds. Cool find :) Look like TP50, TP51, and TP175 are parts of J2 marking right next to it. That'd made me think TP37 must be be 3.3V. that's great news, how did you identify them?